After 20 years in the aluminum fabrication business Tom Kiefer started TNT custom boat works in Fort Pierce, Florida. The year was 1984 and Tom began to build what would become a company dedicated to well designed aluminum work for the marine industry. Tom Kiefer got his start in the United States Navy. His time in the military gave him the experience he needed to move on and develop his own company. The early days found Tom welding and building everything from patio furniture to barges. It wasn�t long before TNT Boat Works was becoming known as a first class marine welding company. 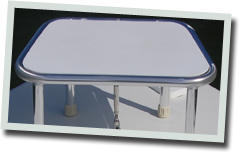 Building aluminum fuel tanks for large sport fish boats in the 50�s put TNT on the map. As Tom was building his company, and making a name for himself, he found the time to start a family. His son T.J. began to come in after school and on weekends to find his way around the shop and the torch. The older T.J. became, the more his father realized that T.J. had a strong interest in the business, and an amazing ability to design, fabricate, and oversee the construction of marine welded products. In 2006, Tom Kiefer passed away. With his passing, T.J. Kiefer was handed the keys to the shop and still maintains his father�s desire to create well designed specialty marine products. Like his father, T.J. stands behind every weld, every design, and ensures that his customers hit the water 100 percent satisfied. 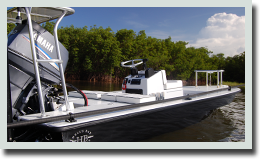 TNT Boat Works uses the finest materials, equipment, and methodology available on the market. 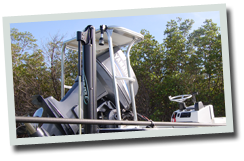 They are always current with the latest technology, and trends in the fishing and boating world. From standardized products, to customized t-tops, poling platforms, and rocket launchers, TNT has always had and will always have a solution as unique as their customers. For more product photos, click here.